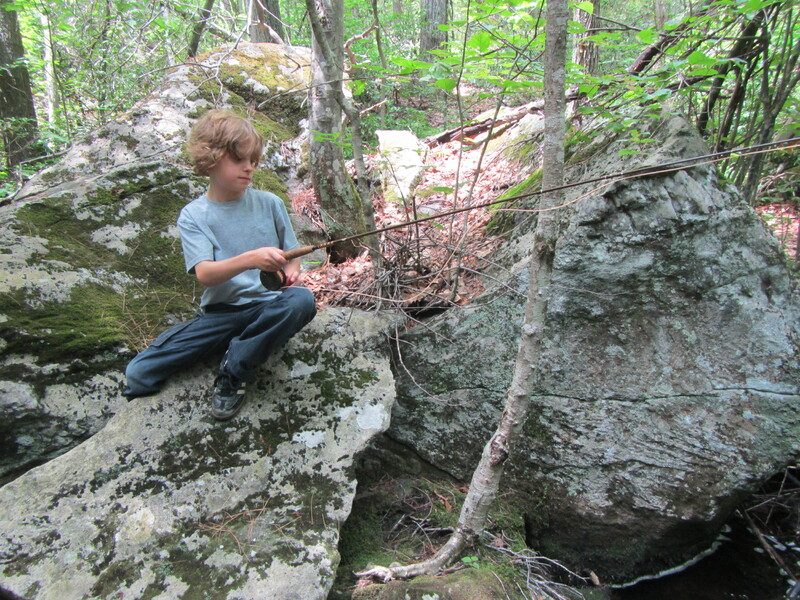 The original plan was to throw streamers in the murky waters of the Farmington. But the river wasn’t high or dirty enough for my liking. Still, needs must fish. What better option than the outgoing tide on a small stream? None, as it turns out. Conditions were perfect: 68 degree air temperature, water at a medium-high level after the rains and running clear and cool (58 degrees). Oh, the bugs! Yes, indeed. 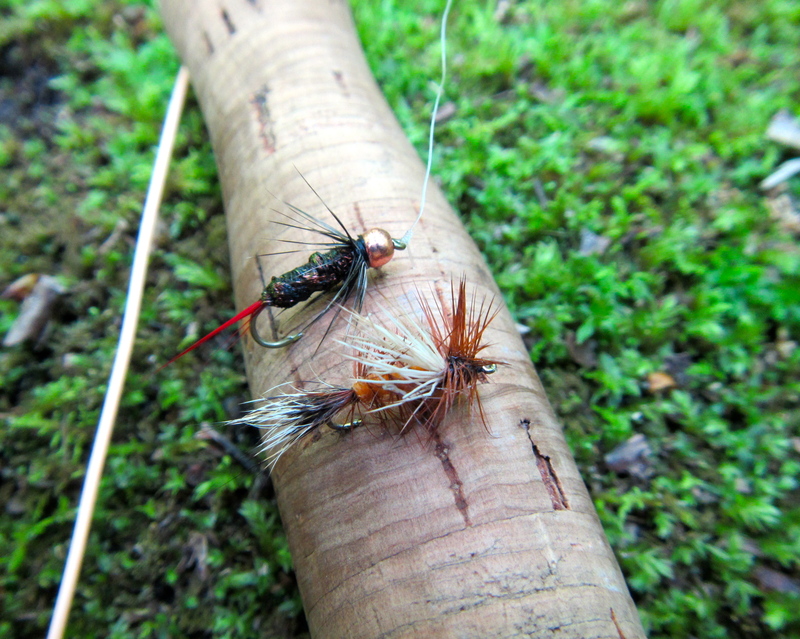 There were the usual suspects, like caddis and midges and mosquitoes. But how about size 16 sulphurs? Size 14-16 golden stones? Heck, let’s throw in some mongo golden stones (size 4-6?) into the mix — I’ve never seen those on this stream. And some egg-laden mahogany dun spinners, size 16. 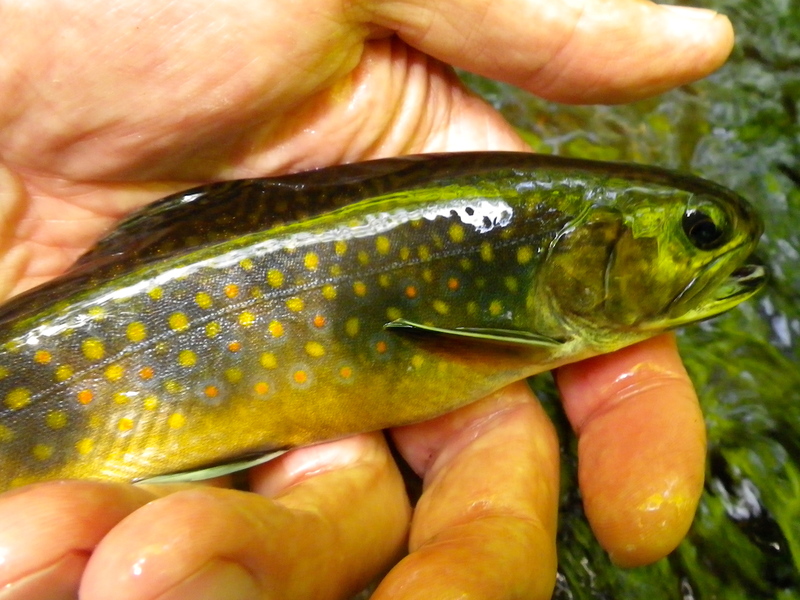 The brook fished very well. 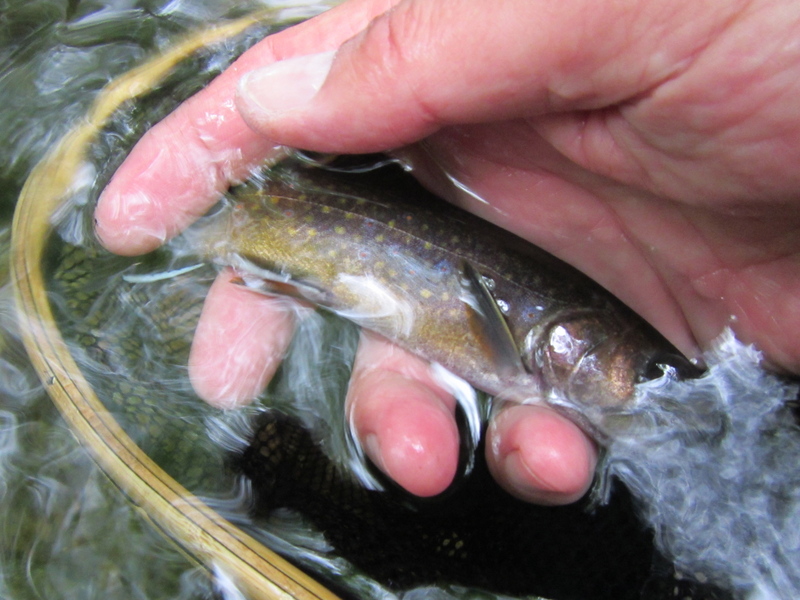 I pricked dozens of fish, many of them in pools where I haven’t caught anything in years. 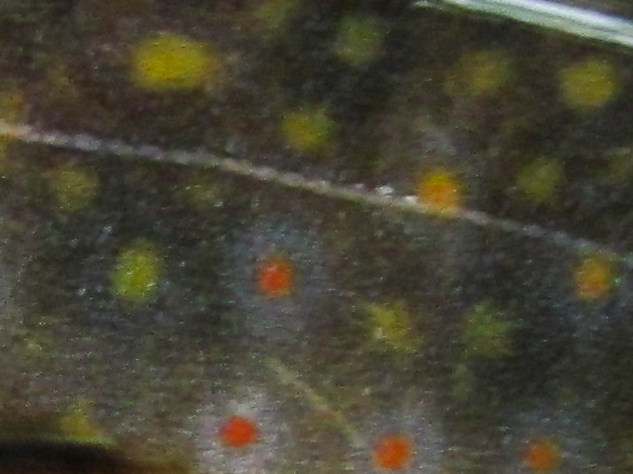 Mostly brookies, but three wild browns in the mix. 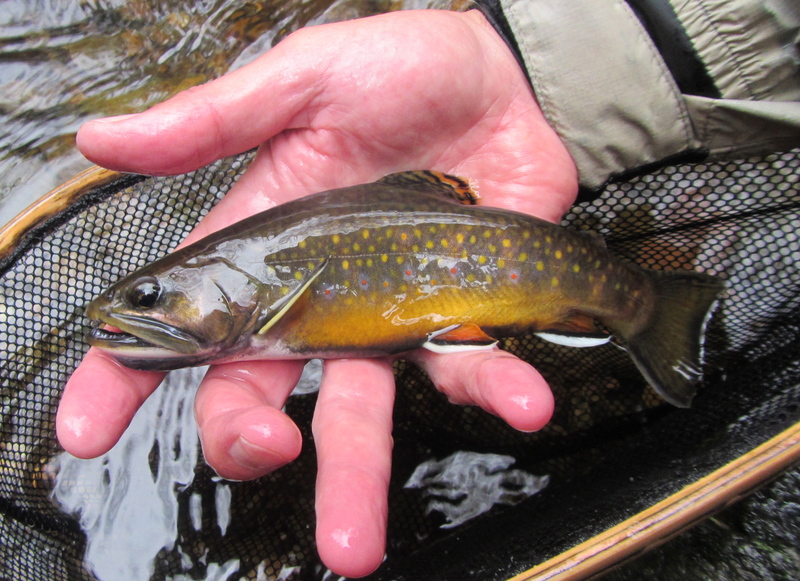 All on the upstream dry (elk hair caddis and Stimulators). After the draconian winter of 2014-2015, how comforting it is to have nature reaffirm that she will always find a way. Intriguing markings on this hen. 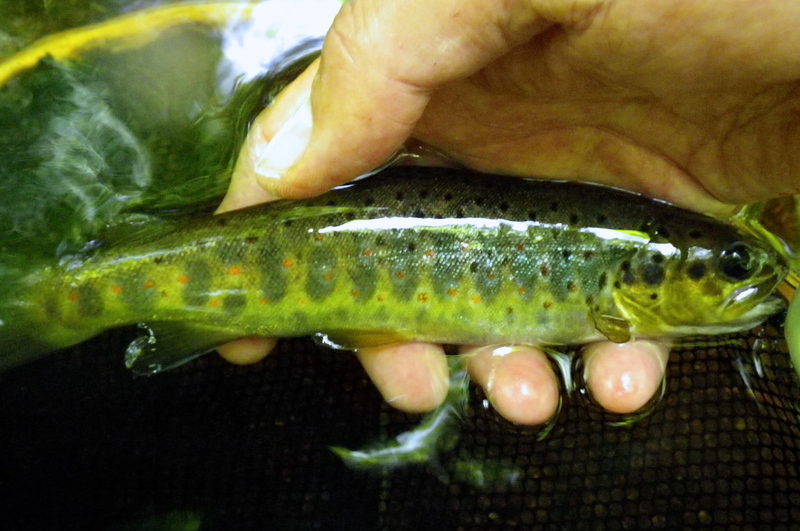 Another hen, this one of the Salmo trutta persuasion. Best hit of the day. She all but slaughtered the fly. You’ll have to bear with me on the substandard photography. I lost my good camera, and my backup had issues today. I hope to have the situation rectified in a few weeks. A bit of a late start this morning. At 10:15am I was making haste into the woods through a phalanx of poison ivy. 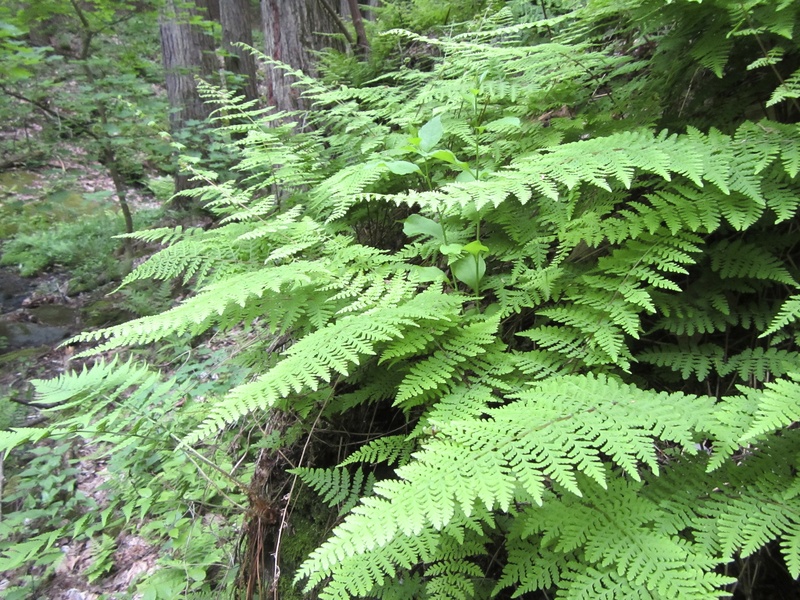 It was already sweltering, even below the canopy. Midges swarmed me. But I only had one cigar, a short robusto, and it would have to wait. The game plan was upstream dry, then downstream wet. In addition to the aforementioned midges, there were little black stones, some creamy mayflies, and (always) regrettably, mosquitos. Summer can’t be far off, for the sulphus had also made an appearance; I saw two spinners captured in spider webs. 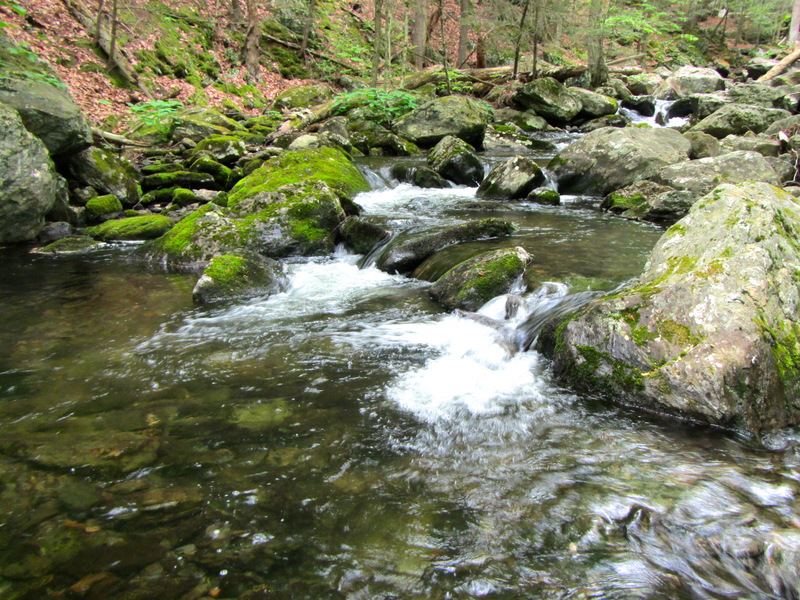 While the air was steamy, the brook was cool 61 degrees and running at an ideal height. Never eat anything bigger than your head. This little guy made seven attempts at the fly before succeeding on the eighth. 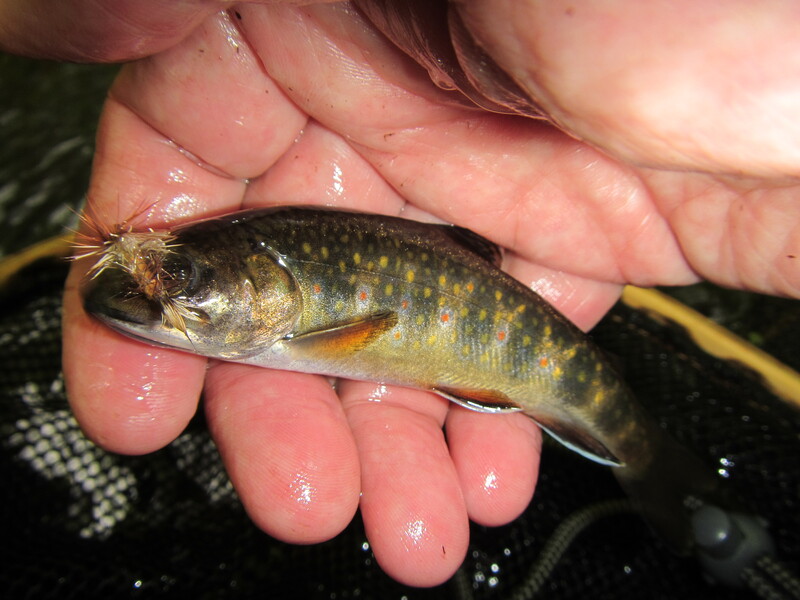 Today’s dry was a size 16 Improved Sofa Pillow, and after a slow start, the brookies began to show themselves in earnest. Pricked far more than I landed, but that was just fine with me. Mostly smaller fish in the mix, although I did land a titan of a wild brown. As usual, there were a few runs were I had no takes on the dry that left me scratching my head. I made note of those pools for the return trip. 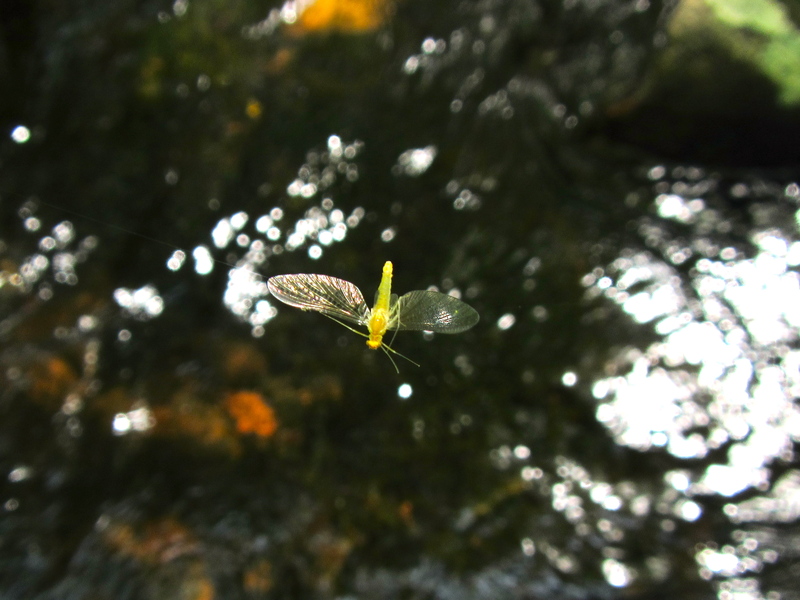 Halfway up the stream, I decided my patience with the nuisance gnats was at an end. Wonderful thing, a cigar. You introduce its tip to flame, and the entire universe of winged insects ignores you. 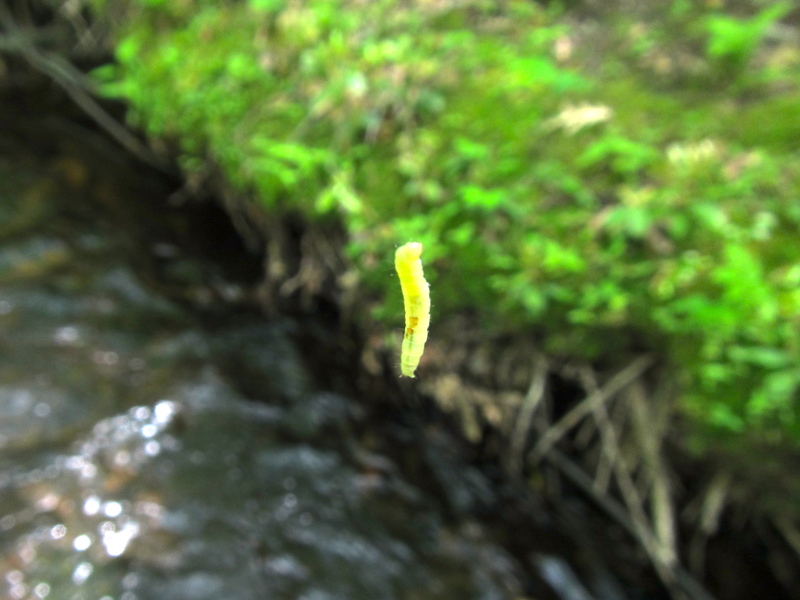 Why a small piece of fluorescent green chenille tied to a hook works so well on a small stream. Dozens of these dangling from trees everywhere. On the way back downstream, I didn’t do as well subsurface as I thought I would. But I still managed to get into plenty of char. Three hours was about all I had in my tank (today’s word should have been “hydration”) so I called it at 1:15pm. A shower beckoned. Besides, I needed to try out that poison ivy soap my wife put in my stocking last Christmas. 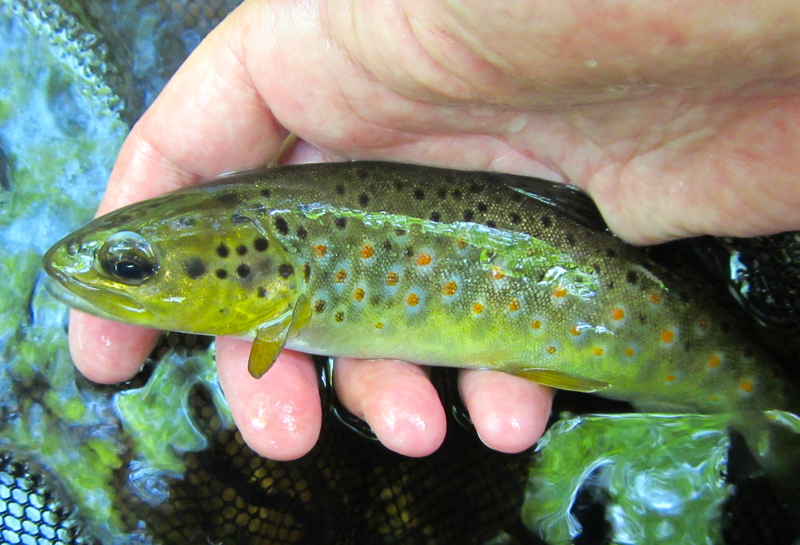 This breathtaking wild brown absolutely hammered the dry. She was so powerful she momentarily put herself on the reel, peeling off a foot of line into the bargain. The sulphur hatch has started. This spinner was still squirming in the web when I walked by. I spent a good chunk of time yesterday planting hydrangeas, amending the soil, taking out all manner of rocks and pebbles so my shrubs would have a nice home. 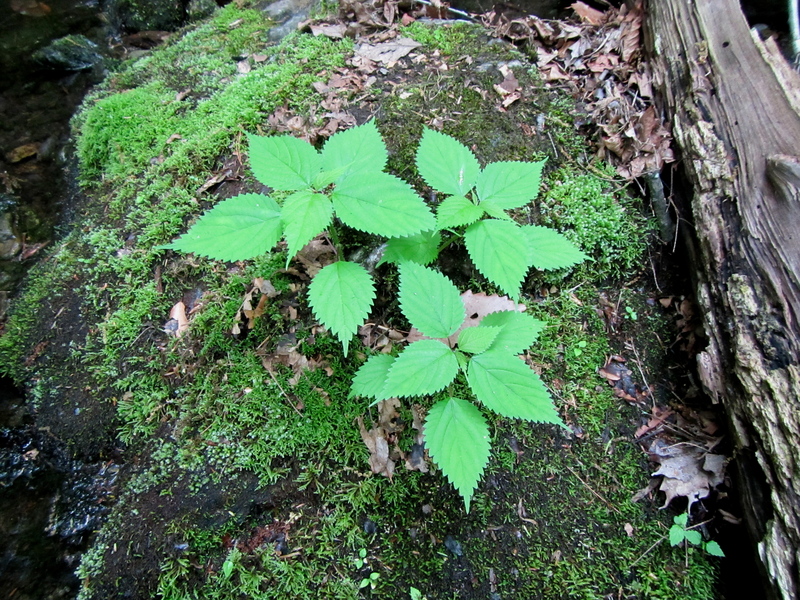 What a kick in the groin to find plants growing green and strong on top of boulders. 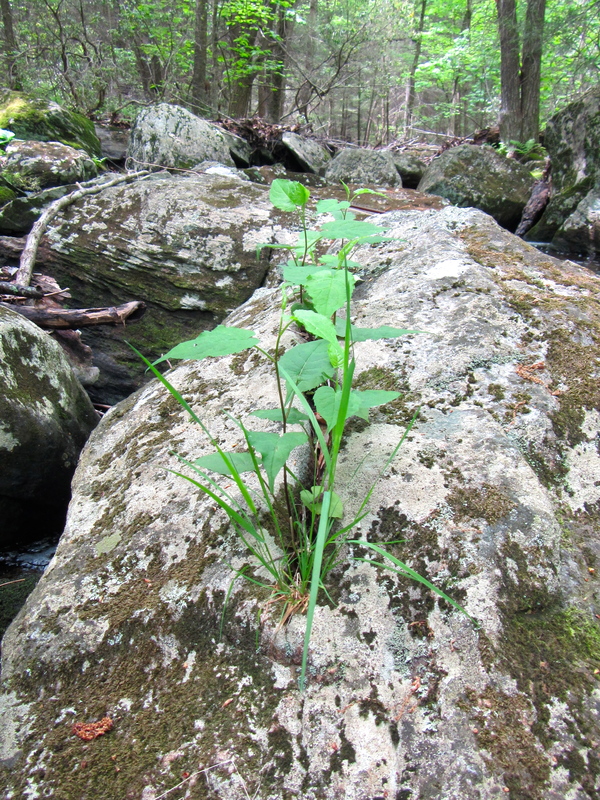 This gives new meaning to the phrase “rock garden.” Once again, nature finds a way. No shaky hands. (Last year there were so many people at my wet fly demo — I had never tied before such a crowd — that my hands were shaking for the first couple hours. I am pleased to report that we’re past that.) But plenty of hand shaking. Thanks to everyone who came out to watch, ask questions, and chat. And thanks the Compleat Angler for hosting me. If you’re anywhere near Fairfield County, the Compleat Angler is a terrific fly shop. Lots of good stuff. Two of the flies I tied, the bead head Grey Hackle Peacock and the Improved Sofa Pillow.